12 Handprint "He Lives!" Magnet Craft Kit. 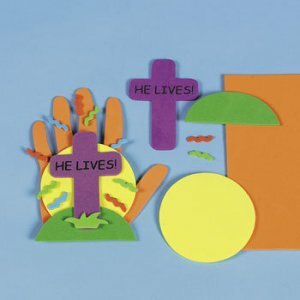 This Easter craft is fun for church groups and Church groups. Simply trace each child's hand on the foam and cut out. Then arrange the other pieces to make a personal and special craft to take home. Finished craft measures approximately 13cm. Nice craft - big foam square allowed for more little hands to be made.